Allegheny County Controller Chelsa Wagner made one thing pretty clear at her Monday morning press conference: She’s not buying the claims Pittsburgh Mayor Bill Peduto and the Allegheny County Health Department are making about how many children are affected by the lead in Pittsburgh’s water. Wagner announced her office would pursue an “expedited audit” of the health department’s programs that monitor and respond to issues of lead contamination. The audit includes an assessment of how the health department collects data about lead in the water. Wagner expects the audit to take a month to six weeks to complete. Wagner questioned the claims Peduto and the health department have been making for weeks. At public forums and in a video for his re-election campaign, Peduto has said the “amount of children in the city of Pittsburgh being poisoned by lead in our water is zero.” Peduto has based his claim on data from the health department that shows the blood lead levels of children in Pittsburgh steadily decreasing since the 1970s. But at a press conference Monday morning, Wagner alleged that the figures cited by Peduto and the health department were likely inaccurate and that children were, in fact, being poisoned by lead in the city’s water. 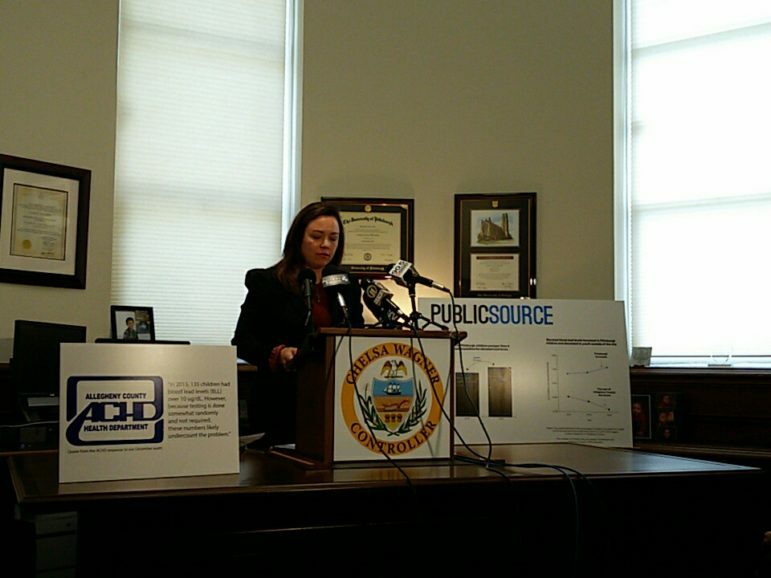 At a press conference Monday, April 24, Allegheny County Controller Chelsa Wagner addressed what she said was "misinformation" about the lead water crisis in Pittsburgh being disseminated by Mayor Bill Peduto and the Allegheny County Health Department. Photo by: J. Dale Shoemaker. Wagner based her claims, in part, on a report PublicSource published last week that pointed out flaws in the health department’s data and the methods it was using to collect the data. That story showed a correlation in a slight rise of elevated blood lead levels among Pittsburgh children who were tested and the timing of a chemical switch made by the Pittsburgh Water and Sewer Authority in April 2014. That chemical switch, which swapped soda ash for caustic soda as a way to control corrosion, lasted until January 2016. But Wagner’s public fact check of the health department and the mayor was nearly lost in the noise by competing events and statements. Bookending her event Monday morning, both the health department and Peduto spoke out about lead in the water in what appeared to be dual efforts to push back against Wagner’s criticisms. Prior to Wagner’s event, the health department h eld a press conference that featured a panel of doctors and other officials who discussed how children are exposed to lead and how blood lead levels in children have been falling steadily since the 1970s. 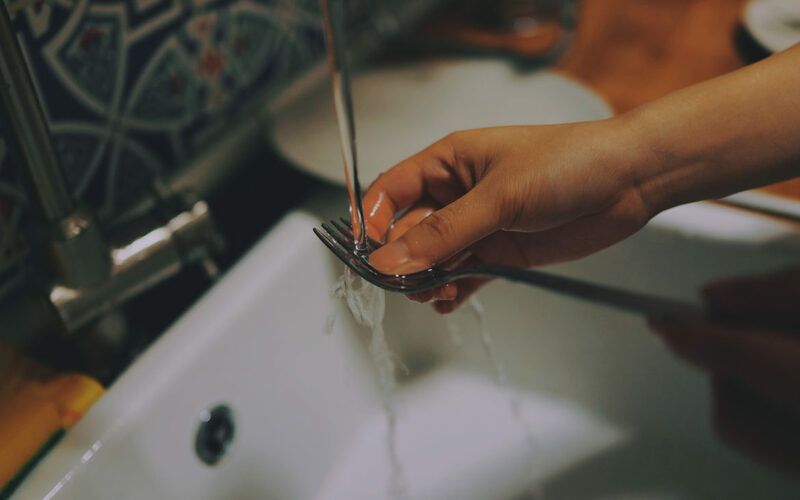 There, Karen Hacker, the director of the health department, said the county would launch a task force to analyze the county’s lead data and methods. Wagner delayed her event by close to an hour once she learned of their event. At the press conference, Wagner pointed out that the mayor had promised that the city would distribute free lead testing kits and water filters to the public but hadn’t provided concrete details about how residents could get them. And the city does need to declare a public health crisis with respect to lead in the water. Immediately following the conclusion of Wagner’s event, Peduto’s office announced citizens could now sign up to receive free lead testing kits and lead filters from the city, something his office said it intended to do several weeks ago. Wagner was skeptical of the timing of both. The county’s press conference, which was organized and announced after she announced hers on Friday, “was very orchestrated” and an attempt to continue to distract the public, she said. The health department, though, said the timing was merely a coincidence. “We do not receive the Controller’s media advisories and so had no knowledge of her press conference plans until it was reported in the Trib [Sunday] night,” health department spokesperson Melissa Wade wrote in an email on Monday. In addition, Wade referred to both PublicSource’s story last week and a later report in the Pittsburgh Tribune-Review as being inaccurate and part of the reasoning for organizing the press conference. She did not offer specifics as to what was factually inaccurate in either story. Katie O’Malley, a spokesperson for Peduto, said in an email that Monday was the scheduled date for the city to announce that lead filters and test kits would be widely available to the public. In response to Wagner’s other charges, O’Malley said the mayor has been “fully committed” to working with the health department as well as state and federal bodies to address the lead problem in Pittsburgh. “We are setting aside politics and doing the hard work necessary to address this problem once and for all,” she wrote in an email. We are setting aside politics and doing the hard work necessary to address this problem once and for all. But there was more, still. Veolia North America joined the slew of lead-related announcements Monday with a statement that announced it was pulling out of mediation with the city and accused the city of defamation. Veolia, which managed the city’s water authority from mid-2012 to late 2015, is currently engaged in a dispute over how the PWSA was managed. “These actions will give PWSA no option other than to pursue its claims in court,” she wrote.